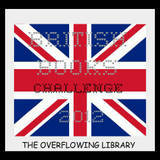 If you didn't already know I am hosting the British Books Challenge in 2012. I love reading books by British authors and wanted to share with you the books I am thinking about reading. If you want to sign up to the 2012 British Books Challenge go to the sign up post before the end of january 2012.